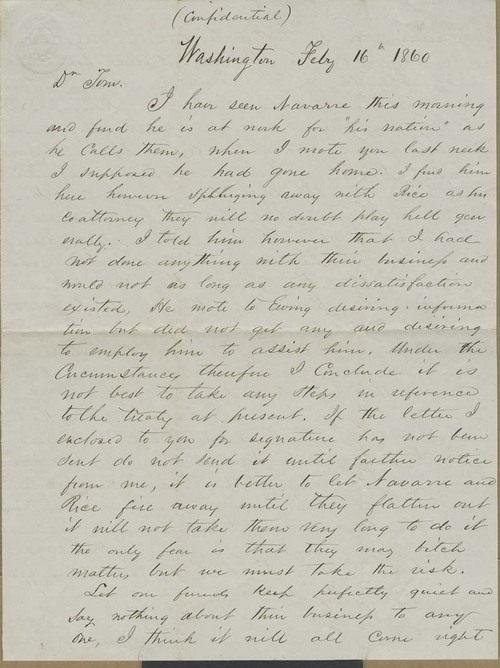 R. Brackenridge, writing from Washington D.C. to Thomas N. Stinson, a resident of Tecumseh, Kansas Territory, commented on the possibility of a treaty with the Pottawatomie Indians who were living in Kansas. Brackenridge expressed negative views about the activities of Anthony Navarre, a Native American who had a following among the Pottawatomie and who opposed a treaty with the U.S. government. The U.S. signed a treaty with the Pottawatomie Indians in November 1861.